Secularist campaign groups are to be stopped from making "vexatious complaints" against the admissions systems of individual faith schools. The government says only local parents will be able to pursue objections against how popular, oversubscribed schools prioritise applications. The schools admissions watchdog has said public money was being wasted by multiple objections by pressure groups. The education secretary says it will be "easier for parents to have a say". 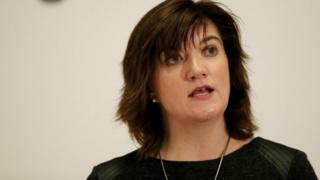 Nicky Morgan says the changes will "unclog" the admissions system for individual schools, by limiting challenges to local parents and local authorities and excluding lobbyists and pressure groups. In particular the Department for Education says it will stop "secularist campaign groups" who have "targeted faith school admissions as part of a particular agenda". Schools Adjudicator, Elizabeth Passmore, has said in her annual report that handling challenges against individual school admissions policies from those with "no connection in terms of seeking a place for their child" is "not good use of an adjudicator's time and public money". Such challenges meant that running the adjudication service was costing more than £1.1m per year. Dr Passmore said campaign groups appeared to be trying to influence wider education policy rather than appealing over admissions rules in schools where they might want to seek a place for their children. She had suggested that the government should consider limiting the range of those who could complain and whether complaints should be able to be made anonymously. The campaign manager of the National Secular Society, Stephen Evans, said: "Many parents will understandably not wish to be named as a complainant and look to groups such as ourselves to challenge unfair admissions on their behalf. "These plans will ensure that this route is now effectively blocked, allowing faith schools to break the admission code with impunity." Andrew Copson, chief executive of the British Humanist Association, said the changes will "reduce parents' fair choice of state schools". "Instead of moving to enforce the law, the government has responded by planning to make it harder to identify future violations of it. This is an affront to both democracy and the rule of law." But Paul Barber, director of the Catholic Education Service, welcomed the government's recommendations, saying it would reduce the "unnecessary burden on teachers' workloads". Mr Barber had said that the use of school admissions appeals by campaigners was unfair and meant "the time of school staff is taken away from supporting pupils to respond to vexatious complaints which serve only to fulfil the campaigning purpose of one organisation". The admission changes announced by the education secretary will also mean that admissions authorities - which could be individual schools or local authorities - will have to consult more frequently on their rules for allocating places. They will have to hold a local consultation at least every four years, rather than seven years as at present. "We want every child to have the opportunity to go to a good local school by making it easier for parents to have a say in their local school's admission process," said Mrs Morgan.